There is no insription on the monument, it is subsidiary to the recognition of the supremacy of the deity, fate or cruel fortune over the value of the fallen Theban heroes. 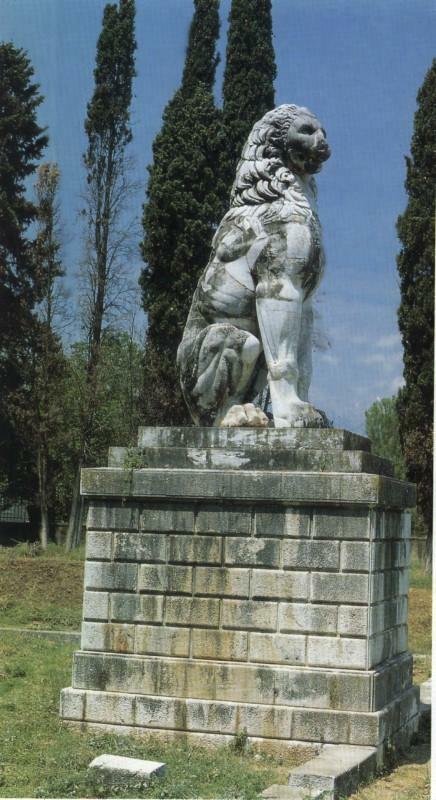 A monumental seated lion was erected facing in the direction of the enemy to commemorate the valor of the fallen Thebans. In the speeches where Aeschines accuses Demosthenes for cowardice1 in battle is mentioned the monument with the figure of a lion. The Sacred Band was a company of 300 picked soldiers maintained by the Theban state. They first attracted attention by defeating a Spartan force in 375 B.C. and played a large part in the victory of Leuctra. At Chaeronea Sacred Band fought to the last man and were buried by the highway from Phocis to Thebes with the figure of a lion over their tomb. Here indeed it is fitting that we should pay the tribute of memory to those brave men whom he, regardless of the smouldering and ill-omened sacrifices, sent forth into manifest danger--he who, when they had fallen, dared to set his cowardly and runaway feet upon their tomb and eulogize the valor of the dead.1 O man of all mankind most useless for great and serious deeds, but for boldness of words most wonderful, will you presently undertake to look this jury in the face and say that over the disasters of the city you must be crowned? And, gentlemen, if he does, will you endure it? Are we to believe that you and your memory are to die with the dead? -Of necessity it happens, when a battle takes place, that the one side is beaten and the other victorious; but I should not hesitate to assert that in my judgement the men who die at the post of duty on either side do not share the defeat but are both alike victors. For the mastery among the survivors is decided as the deity disposes, but that which each was in duty bound to contribute to this end, every man who has kept his post in battle has done. But if, as a mortal being, he meets his doom, what he has suffered is an incident caused by chance, but in spirit he remains unconquered by his opponents.